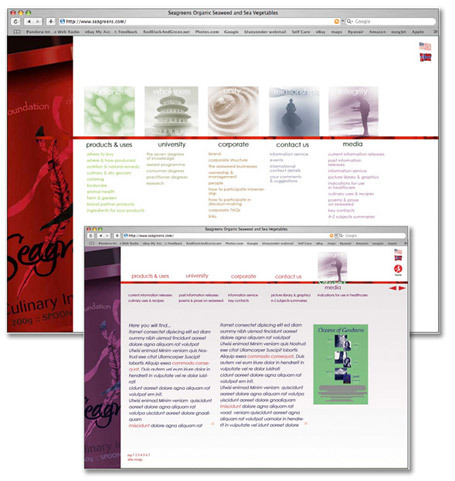 To create a stunning, easy to use and accessible website that clearly communicates the values of Seagreens. Combining inspiration from nature, the sea and the harmony & balance that seaweed bring, we created a stylish and informative website that conveys the balance inherent in the products. Using soft muted colours and a striking red for energy we have also communicated the credibility of Seagreens as a business proposition. Allowing viewers to quickly access any area directly, the site engages at any landing point, clean lines and a strong palette of colours clearly distinguish each area. A truly inspirational website, with a huge amount of information for both customers and partners. Soft, stylish and easy to use, this positively reflects Seagreens values.